Listed on this page are revenue stamps issued for the British Colony of Aden prior to 1962. Later issues inscribed Federation of South Arabia (1962-67), the People's Republic of South Yemen (1967-70) or the People's Democratic Republic of Yemen (1970-90) are listed under Yemen (Southern / PDR). Unless otherwise stated, all issues were printed or overprinted (offset-litho) by Security Printing Press, Nasik, India. 1940 (earliest recorded usage). 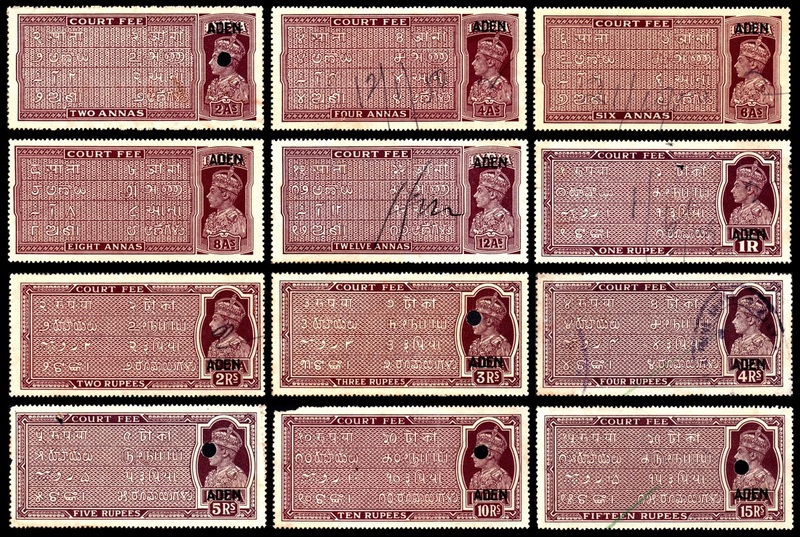 King George V Court Fee issues of India (76 x 34 mm) overprinted ADEN. Perf 14 x 12. Wmk Multiple Stars. Note: I have also seen the 8a, 2r, 5r and 15r values similarly overprinted, but I am unable to illustrate these at present. 1937 (earliest recorded usage). As previous issue but portrait of King George VI. Perf 14 x 12. Wmk Multiple Stars. Note: I have also seen the 20r similarly overprinted, but I am unable to illustrate this. c1957. Anti-Tuberculosis fundraising labels inscribed FIGHT TB IN ADEN. Dhow, dagger and camel designs se-tenant, each 27 x 21 mm. No value indicated. Roulette 6½. No watermark. Note: according to John Denune's Christmas Seals website, this issue was printed in sheets of 100 with a large background design of a dhow, presumably in yellow. Certain stamps in the sheet therefore have a plain white or yellow background, while other stamps have patches or bands of yellow as shown on my illustration of L1 above. I am grateful to Carmel Axiaq for bringing the Seals website to my attention. c1937-40s. Notarial issues of India (22 x 38mm) overprinted ADEN. Perf 14. Wmk Multiple Stars. Illustrated above is a British postal order overprinted for use in Aden. The fee (poundage) of 1½d sterling has been surcharged in East African currency, which was used in Aden from 1951 onwards. British postal orders were issued in a wide range of values and it is likely that many of these were overprinted for Aden. Such items are not listed on this website but further information can be obtained from the Postal Order Society. 1937. Key types of India (King George V) inscribed ADEN REVENUE in lower appropriation tablet. Perf 13¾ (2a to 12a) or perf 14 (1r to 4r). Wmk Multiple Stars. Note: I have also seen the 2r of this series but I am unable to illustrate this at present. Barefoot additionally lists the 5r and 10r values, which I have not seen. c1940. As previous issue but with portrait of King George VI. 18 x 29½ mm (2a to 12a), 21½ x 38mm (1r to 10r), 20½ x 56½ mm (50r). Perf 13¾ (annas) or perf 14 x 13¾ (rupees). Wmk Multiple Stars. Note: for ease of reference, numbering follows the Stanley Gibbons Part 1 catalogue throughout this section. Values listed here are those recorded as having been used for revenue purposes. Dates of issue are as given in Gibbons. 1939-48. Various pictorial designs featuring portrait of King George VI. 25 x 30 mm. Perf 12½. Wmk Multiple Script CA. Printed (recess) by Waterlow. 1951. As previous issue but surcharged in East African currency by Waterlow. 1953-59. New pictorial designs featuring portrait of Queen Elizabeth II. 25 x 30 mm (horiz) or 30 x 25 mm (vert). Perf 12 except where otherwise stated. Wmk Multiple Script CA. Printed (recess) by Waterlow.